SmartCells Anti-fatigue mats and flooring are ergonomically engineered to reduce fatigue and pain associated with standing for extended periods of time and are perfect for use in pharmacies and labs. 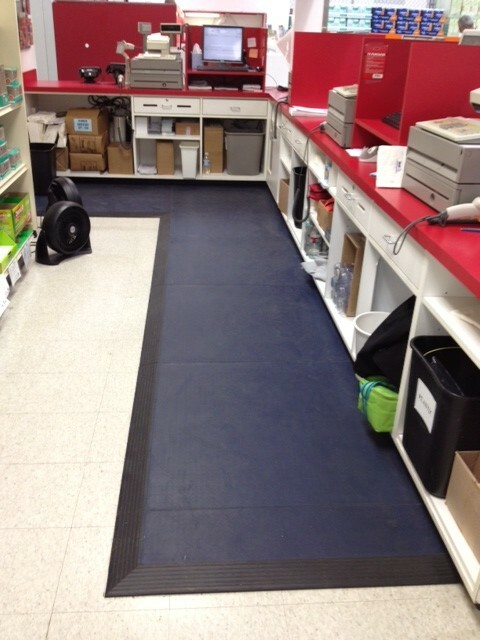 SmartCells Anti-fatigue mats, runners and flooring are perfect for use in a pharmacy setting. According to the Federal Drug Administration approximately 1.3 million people are injured each year due to preventable medication mistakes. These preventable medication-mistakes cost the healthcare system $2 billion each year. Statistically, a pharmacist fills a prescription every 7.5 minutes. 8 every hour. 64 every day. 321 every week. 16,667 every year. According to a recent study, nearly 4 billion prescriptions are filled each year and there are only about 240,000 pharmacists nationwide. With these kinds of numbers it should be no surprise that over 51.5 million prescription mistakes occur every year, and any reasonable step than can be taken to avoid mistakes is worth considering. Most pharmacists concur that distractions and fatigue significantly influence the number of errors. 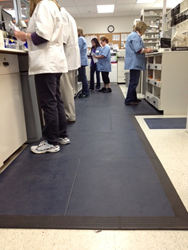 Pharmacists can spend a great deal of time on their feet walking between storage isles, compounding areas, computer terminals and customer service counters. This extended time standing and walking contributes to fatigue and musculoskeletal stress that becomes a nagging and painful distraction. This is corroborated in a recent study by the Journal of the American Medical Association that found 13% of all workers experience pain in the workplace that reduces productivity. 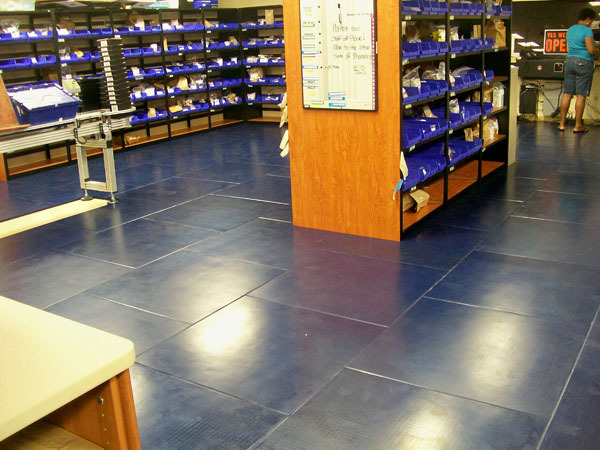 SmartCells anti-fatigue flooring and matting is one solution applied by leading pharmacy groups, including the US Military and leading healthcare providers throughout the country. SmartCells Anti-fatigue custom flooring, mats, and runners provide an effective solution for reducing the fatigue and related pain from standing work. The unique SmartCells® cushioning technology consists of a rubber surface layer integrated with an underlying array of cylindrical rubber cells that soften in response to surface pressure to provide maximum fatigue relief. The SmartCells act like springs that cushion as weight is applied and then rebound when the weight shifts, which returns energy and reduces fatigue associated with standing. SmartCells anti-fatigue products provide optimized compressibility and a stable surface that responds dynamically to subtle and overt movements of the body. Typical soft and squishy mats do not provide the right compressibility, are often unstable, and frequently bottom-out aggravating the very problems the users are seeking to solve with a floor mat. The renowned SmartCells cushioning technology by SATECH, Inc. is trusted by leading companies that take employee safety, comfort and productivity seriously. The SmartCells anti-fatigue technology is especially important where infection control is critical. SmartCells are made of non-porous rubber that will not absorb liquid, unlike typical foam mats. With the addition of SATECH’s new online retail store, acquiring SmartCells anti-fatigue products has never been easier. On SATECH’s website pharmacists and consumers can view different variations of SmartCells products, learn about the technology and determine which solution is best for them. SATECH Inc. is a technology company that specializes in the development and marketing of SmartCells cushioning solutions that enhance performance, reduce fatigue and help prevent fall-related injuries. SmartCells mats and flooring have broad application in the industrial workplace, healthcare markets, and everyday consumer households. For more information, please call (360) 748-8711, visit http://www.smartcellsusa.com or view the following video: http://www.smartcellsusa.com/about/videos/. SmartCells Anti-fatigue products help reduce fatigue-related prescription errors by keeping pharmacists feeling good. SmartCells Anti-fatigue products help reduce fatigue-related prescription errors by keeping pharmacists feeling good.